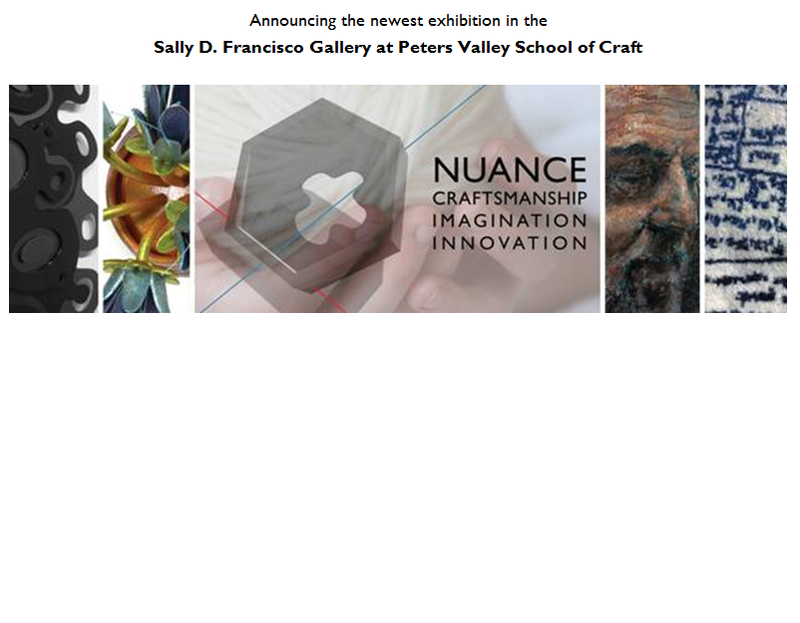 Peters Valley School of Craft is pleased to announce a new, juried exhibition in the Sally D. Francisco Gallery. 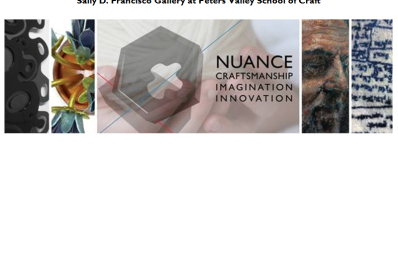 Nuance: Craftsmanship, Imagination and Innovation will be on view April 13 – May19, 2019. An opening reception will be held from 3:00-5:00pm on Saturday, April 13th with a Gallery Talk at 3:30pm. The exhibition features 1-2 works by 50 artists from around the county. The selection was guided by jurors Maegen Black, Director of the Canadian Crafts Federation and Sin-ying Ho, Ceramist and Assistant Professor at Queens College, City University of New York. The scope, scale and medium of work included varies greatly. The work included in this exhibition represents the merger of hands and technology in contemporary craft. These artists have utilized technology to expand their work and forward the field of craft. They show what is possible when technology is used to design and fabricate components or facets of handmade work. Most importantly, the diversity of work exemplifies how the human nuance can be augmented through innovative applications of technology. In the past, many people saw craft as deeply rooted in craftsmanship— body knowledge based in tradition and acquired through skill building, resulting in a harmonic merger of hands, hearts, minds and tools. The definition has expanded as fine artists today explore craft materials to their potential. Now artists have many more tools and machines available to them including computer programs that aid in the design process, and digital mechanisms available to cut, print and form materials. Mac, by Perry Johnson,exemplifies the nuance of hand and technology excellently. The artist creates works on metal that incorporate traditional, old painting materials, in this case oil, with marks and patterns created on digital software and etched in the metal surface. Peters Valley School of Craft has encouraged the sharing of knowledge through experiential workshops for over 49 years. The school fosters the future by embracing innovative methods including new materials, approaches and the use of technology for the design and fabrication of fine craft. Participating artists are: Tricia Adler, Pru Albers-Brig & Oliver Brig, Lyn Aleksandrowicz, Justin Bailey, David Beker, Joyce Billet, Abbey Blake, Kenneth Burton, Yu-Chi Chien, Ann Clarke, Addison de Lisle, Kelsey Dillow, Steve Donegan, Rachel Green, Jason Hackett, Robin Haller, Corin Herzog, Virginia Hinchman, Maggie Horvath, Lia Huntington, Perry Johnson, Talya Kantro, Deborah Kaplan, Brianna Lancaster, Daryl Lancaster, Victoria Lansford, Christina Lemon, Heather McGinley, Erin Miller, Julie Morringello, Michal Niv, Vincent Pontillo-Verrastro, Mike Richison, Czashka Ross, Heather Schulte, Anita Seltzer, Katlin Shae, Leah Siegel, Ellen Sisti, Melinda K.P. Stees, Aric Verrastro, Gaylia Wagner, Jake Weigel, William Westheimer, Zachary Wollert, Danni Xu, Xinhao Yang, Yingqi Zhao, Valerie Zimany and Katrin Zimmermann. The Gallery at Peters Valley School of Craft is located at 19 Kuhn Rd., Layton, NJ 07851 and is open Thursday–Sunday from 10a–5p through April, and daily from 10a–6p beginning May 1st. Peters Valley School of Craft is a non-profit educational center for the exploration, promotion and practice of fine craft, located in the Delaware Water Gap National Recreation Area. Funding for Peters Valley is provided by the New Jersey State Council on the Arts, a Partner Agency of the National Endowment for the Arts and New Jersey Historic Trust, the Geraldine R. Dodge Foundation, Marie & John Zimmermann Fund, Windgate Charitable Foundation, Charles Lawrence Keith & Clara Miller Foundation, Lenore G. Tawney Foundation, The Greater Pike Community Foundation, New Jersey Cultural Trust and by the generosity of its members and individual donors. Please visit www.petersvalley.org for more information. For more information contact Gallery Director Brienne Rosner at gallery@petersvalley.org or call (973)948-5202. Location: Peters Valley School of Craft Inc.